Are you enjoying watching the Olympics? Even when the outcome is known in advance (thank you Internet), I find myself mesmerized by the games. The most vivid example is beach volleyball. Before this Olympics, it wasn’t on my radar screen. Now that it’s over, I can’t wait till Rio in 2016. The atmosphere at the beach volleyball venue is like a carnival. Fans are standing, clapping and dancing. Loud music is blaring, like a party is going on and oh by the way, some volleyball is being played too. The best part is during set point and match point. The crowd roars to a fever pitch. The chorus of the Queen song, Another One Bites the Dust, is cranked up with no words, but extra bass. You know the rhythm. Ba-Ba-Bump-Bump-Bump, Ba-Ba-Ba-Ba-Ba-Bump. I’d hate to be the team on the verge of losing. The frenzied crowd looks like spectators at a gladiator match in the Roman Coliseum. They want blood. One team has the other by the throat and looks to the emperor, who pleases the crowd by pointing his thumb down, indicating no mercy. It’s time for the kill. That’s the atmosphere in London. Wonder what Rio will be like? Do your competitive juices have you tracking the total medal count with China? I check it every day and am glad the Americans have pulled ahead thanks to track and field. I have pinpointed China’s strength. China holds a 13-0 advantage in medals in two “sports” – badminton and table tennis. Can we all agree that badminton and ping pong do not belong in the Olympics? Some badminton players were expelled from the London games for cheating. One observer said he hoped they were ashamed. Another responded, “How can you shame them? They are adults playing badminton, a child’s sport. They already have no shame.” Makes me wonder if hide-and-go-seek will be admitted as a sport. As for ping pong (somehow table tennis sounds too dignified), the affable Larry the Cable Guy put it best. He said that any sport you can play while drunk should not be allowed in the Olympics. One of the most significant characteristics of these Olympics is the accomplishments of women. For the first time, Saudi Arabia let a female compete. Also for the first time, American women outnumber their male counterparts. They are making us proud. American women have dominated basketball, soccer and volleyball, as expected. Women also have succeeded in gymnastics and swimming. Gabby Douglas and Missy Franklin are household names. Claressa Shields won the first boxing gold medal for the United States since 2004. Allyson Felix finally won gold in the 200 meters. Women won America's only medals in boxing, cycling, fencing and judo. 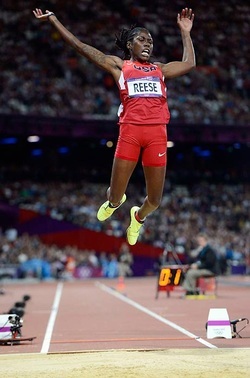 Best of all, Gulfport, Mississippi native Brittany Reese became the first U.S. woman to win the long jump since Jackie Joyner-Kersee in 1988. London is to be congratulated for staging an outstanding 30th Olympiad. The American athletes have made us proud as worthy champions and competitors. Thankfully, with all the problems in the world, the Olympic spirit, as William Faulkner might say, not only endures, it prevails.